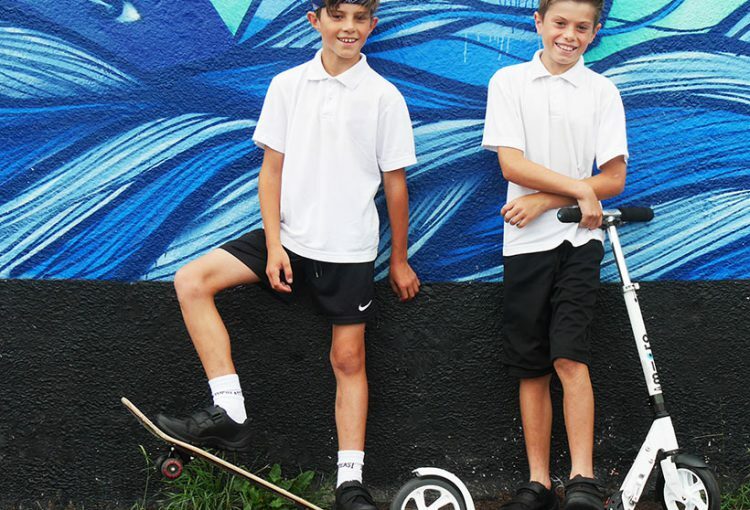 With 5 boys in our house finding a one-size-fits-all anything is no mean feat – whether it’s a meal they will all eat, an activity they all want to do or a film they’ll sit down and watch; arguments ensue and my patience becomes frazzled. So, when it came to kitting them out for September, back to school, I didn’t fancy traipsing around a concrete town centre on a summer’s day to find that shops don’t have the plethora of sizes our crew require or trawling the internet and waiting for 10 different parcels to arrive, only to discover someone’s lunch box went missing courtesy of DPD. We needed a one-stop-shop, where everyone, including me was happy with their back to school kit; whether that’s Casper’s (2.5 yrs) brightly coloured backpack for nursery, indestructible school shoes for the U11s or the right cut school trousers for the fussy teenagers. Which is why I bloomin’ love the John Lewis “Back to School” shop. John Lewis have thought of every educational eventuality and even compiled a handy Back to School checklist, so the most sleep-deprived, under-caffeinated mangled-mess of a summer holidays parent among us can’t forget the water bottle this year! From lunch boxes to school shoes, stationery to watches to make sure they get there on time – I’ve kitted our crew out in John Lewis in one fell swoop so we’ve got more time to have fun this summer (or what’s left of it!). School shorts; Stationary; Mi-Pac Rucksack; Tin Lunch Box; Start-Rite Warrior School Shoes; Sharpie Fabric Markers; Polo Shirts; Adidas Water Bottle. 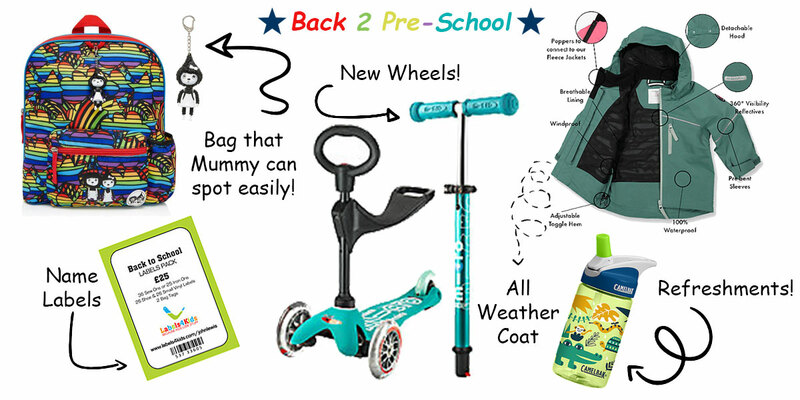 Babymel Zip & Zoe Rucksack; Back to School Labels Pack; Micro Scooter for 1-5 year olds; Polarn O. Pyret Coat Green; Dino Water Bottle. 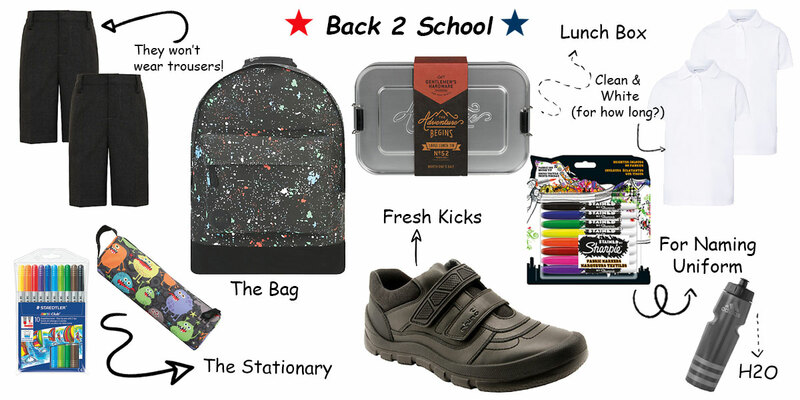 So now know about the John Lewis Back to School Shop, here’s the 5 things that I was (pleasantly) surprised to find on John Lewis’ website that I might’ve otherwise, erm, not remembered for a little while longer – I’m sure we would’ve got there in the end! Name Labels School Coats High-Vis Jackets for those pesky autumn nights drawing closer. Draw-String PE Bag Lab Coats Thanks to Jess for this amazing post!